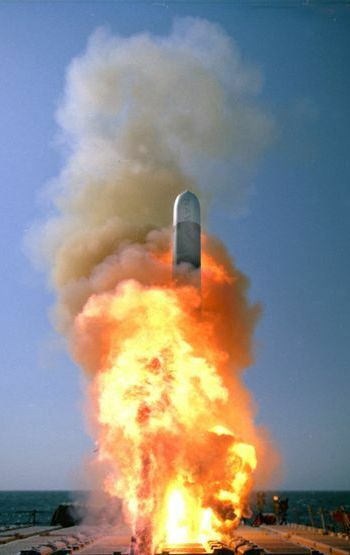 Even though the Tomahawk missile predates the crashing of the SDF-1 and the introduction of Robotechnology, the missile was found to be very useful and serves the RDF in both anti-ship and ground strikes. The missile has been updated and the guidance has been replaced by an advanced copied from reflex missiles and has +5 to strike and +3 to dodge. The original guidance was accurate enough to put the missile through a meter square hole and with the new system, it is even more accurate. Along with the new guidance system, more powerful warheads have been fitted on the missile. The missile is a surface skimming which keeps the missile concealed by the horizon and the missile retains the same propulsion as the original missile. This gives the missile slightly less range than long range reflex missiles but this is compensated by the heavier warhead. Missile Length: 18 ft 3 in (5.560 m).